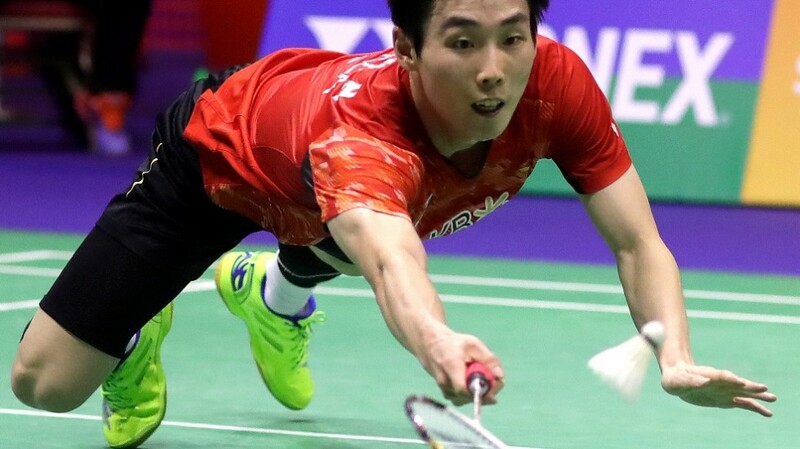 Son Wan Ho – a player whose admitted mental fragility has cost him important matches – savoured an admirable comeback today versus man-of-the-moment, Kento Momota, to propel him into Men’s Singles final at the YONEX-SUNRISE Hong Kong Open 2018. Given the odds stacked against him, having not beaten the Japanese wonder in four encounters since the latter’s return to the top flight – and with Momota in seemingly irresistible form – Son (featured image) displayed the grit and willpower which have often deserted him on big occasions, triumphing 18-21 21-16 21-19 in 90 absorbing minutes. 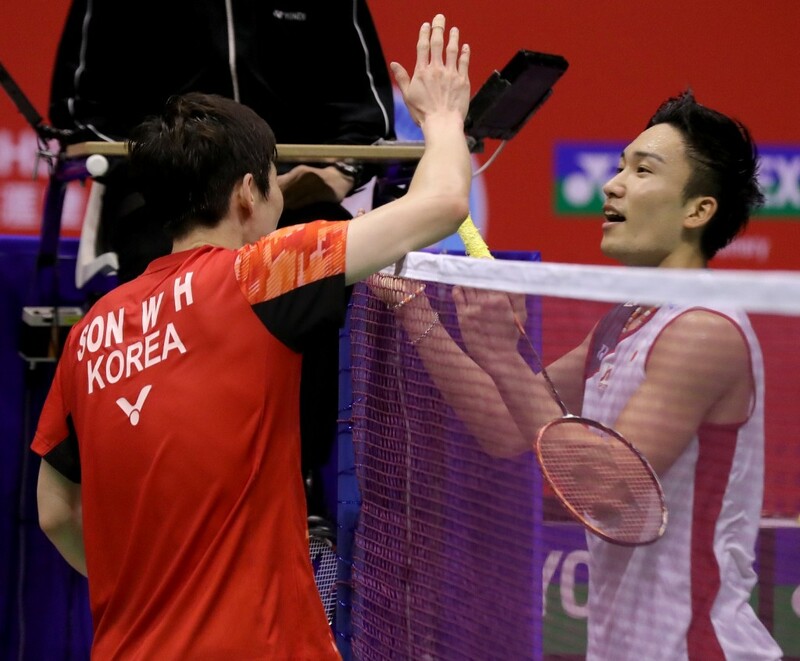 The Korean’s semi-final victory would have been all the more pleasing for the manner in which it was achieved as he weathered an early Momota onslaught. The world No.1 was off to a commanding start, leading the opener 10-13 and then 17-11, gliding across the court and dazzling with his mesmeric strokes. Settling into the match, Son gave a hint of what was to come as he enjoyed a run of six straight points to draw level before Momota regained control to change sides a game up. Fans were perhaps expecting a quick and deadly second game but it was not to be as the No.6 seed refused to let his adversary get away. Holding a one-point lead at the interval, Son never looked back as he locked horns with the World champion who erred more frequently with his shots. A spicy cross-smash on Son’s first game point ensured a decider, with Momota clearly exhibiting signs of fatigue. Nonetheless, the 24-year-old lifted his attack to lead 13-10 with the finish in sight. A combination of enterprise and luck brought Son to 14-14 before he produced some monster smashes to eke ahead 17-15 and then some all-court prowess to grab a precious 19-16 advantage. Meanwhile, Momota was on his haunches, trying to regain his composure. Under pressure from Momota, Son then threatened to slip back into his old habits, spraying the shuttle wide on three successive occasions as the umpire confirmed the 19-19 score. It was now or never for them both and, in an unexpected twist, it was Son who came up with the goods; earning match point with a titanic smash down the line that wrong-footed his rival, ending an exhausting 44-shot rally. Moments later, Son seized the initiative again with a trio of smashes, the last of which the top seed returned into the net. The mammoth blockbuster was finally over; Son sinking to his knees and screaming exuberantly before being congratulated at the net by Momota, both men panting hard from their energetic exploits. It was the winner’s first defeat of his opponent in three years to even their head-to-head record at 5-5. Japan will still have a stake in the men’s solo final as Kenta Nishimoto thwarted the dream of Hong Kong qualifier, Lee Cheuk Yiu. The No.8 seed controlled the proceedings for a comfortable 21-18 21-12 win, though Lee gave a decent account of himself. 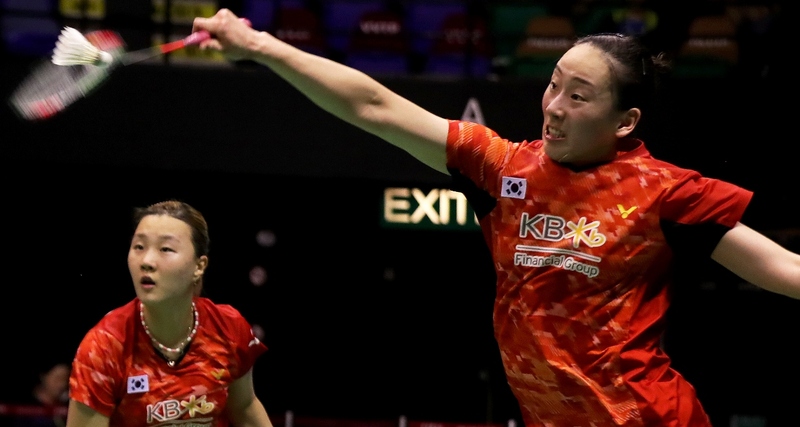 The conclusion of this match brought Nishimoto’s Women’s Singles peer, Nozomi Okuhara, to the court for her semi-final showdown with defending champion, Tai Tzu Ying, for what spectators hoped would be another exciting battle. However, it was evident from the outset that all was not well with Tai; her crisp strokes and sure movements out of synch. By contrast, Okuhara was immediately into stride and concentrated on her mission, taking the first game 21-12. She was 3-1 up in the second when Tai retired, her shot at a hat-trick of Hong Kong titles over. 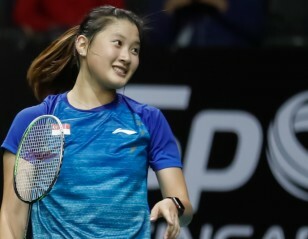 Okuhara’s success ensured Japan will have an interest in all five finals as her Men’s Doubles (Takeshi Kamura/Keigo Sonoda), Women’s Doubles (Yuki Fukushima/Sayaka Hirota) and Mixed Doubles (Yuta Watanabe/Arisa Higashino) team-mates had earlier advanced to tomorrow’s championship deciders. Battling Okuhara for the title will be Ratchanok Intanon who has put together a decent showing this week. The Thai star outlasted Korea’s Sung Ji Hyun, 10-21 21-11 21-17, in 69 minutes. “I didn’t play well in the first game but I didn’t give up. I pushed myself to do better – point by point – and I became more confident. I had to be patient, even after winning the second game. In the third game, I was leading but she came back and it was 17-17. I had to focus and play safely and I was able to win,” recounted Intanon, who expects a tough clash with Okuhara. In Men’s Doubles, Kamura/Sonoda will be across the net from their Indonesian archrivals, Marcus Fernaldi Gideon/Kevin Sanjaya Sukamuljo, who are keen to wrest a record-breaking eighth Tour title this season. The top seeds and defending champions weathered a creditable challenge by their elder compatriots, Mohammad Ahsan/Hendra Setiawan, eventually prevailing 21-14 18-21 21-9. The chance of a same-country final was thwarted when Kamura/Sonoda defeated Indonesia’s Fajar Alfian/Muhammad Rian Ardianto (24-22 21-15). Indonesia’s Women’s Doubles aspirations were extinguished when Greysia Polii/Apriyani Rahayu lost a marathon versus top seeds, Fukushima/Hirota. Despite taking the first game with four straight points, the No.4 seeds were worn down in a match that featured attritional defence – one rally lasting 148 shots – mixed with strong attacks. The Japanese triumphed 20-22 21-9 21-12 in an hour and 45 minutes. The other semi-final was much quicker, with Lee So Hee/Shin Seung Chan polishing off another Japanese duo, Shiho Tanaka/Koharu Yonemoto, 21-16 21-12, in just 48 minutes. The Koreans are hunting back-to-back honours, having won the Fuzhou China Open 2018 last Sunday. The Mixed Doubles crown will be bestowed on either China’s Wang Yilyu/Huang Dongping or Yuta Watanabe/Arisa Higashino of Japan. The All England title-holders breezed past Lee Yang/Hsu Ya Ching of Chinese Taipei, 21-11 21-10. 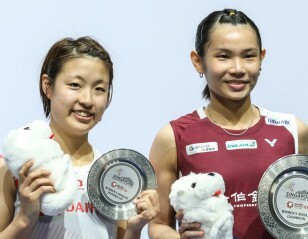 Meanwhile, Wang/Huang overcame Dechapol Puavaranukroh/Sapsiree Taerattanachai of Thailand (21-17 21-13).